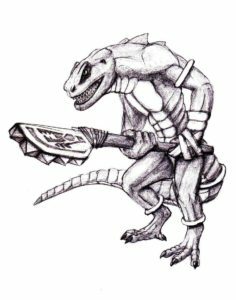 The fearsome, combative, plains-dwelling Kala people (think lizardfolk) send powerful, elite warriors into battle to direct their forces. As mentioned in other entries for kala fighters, they prefer to focus their attention on one powerful enemy and take him or her down, mostly ignoring other enemies. The elite warrior chooses this target, and directs the other fighters with cunning. For example, if one spellcaster is doing serious damage, the elite warrior might call on its archers to focus fire on that spellcaster. Also, if an enemy seems near death, the elite warrior will often order the bulk of the warriors to move on to another powerful enemy while a few remain to mop up. It also has a nasty ranged feature: two bags of explosive powder. It can throw these as a ranged attack, but that’s just the half of it. When the elite warrior dies, the force of its big, scaly body hitting the ground causes the bags to explode, dealing damage to all enemies nearby. Pack Tactics. The archer has advantage on attack rolls against a target if at least one of the archer’s allies is within 5 feet of the target and the ally isn’t incapacitated. Bloodied Frenzy. The elite warrior deals an extra 1d6 damage on attacks when reduced to half its Hit Points or fewer. Explosive Death. (Optional) When an elite warrior is reduced to 0 or fewer Hit Points, it detonates its remaining blast powder, dealing 1d8 force damage to each creature within 5 feet per remaining blast powder bag. Greatsword. Melee Weapon Attack: +6 to hit, reach 5 ft., one target. Hit: 10 (2d6+4) slashing damage, or 13 (3d6+4) if at half HP or fewer. Blast Powder Bag. Ranged Weapon Wattack: +4 to hit, range 30/120, one target. Hit: 6 (1d8+2) force damage, and the target must succeed on a DC 12 Constitution save or be knocked prone. The warrior carries only 2 of these bags. Sling. Ranged Weapon Wattack: +4 to hit, range 30/120, one target. Hit: 4 (1d4+2) bludgeoning damage. The elite warrior is the most flexible, filling in wherever it can do most damage, whether that’s ranged attacks against lone spellcasters, assisting warriors in taking down a powerful melee enemy, or sneaking behind enemy lines to threaten an important non-combattant.